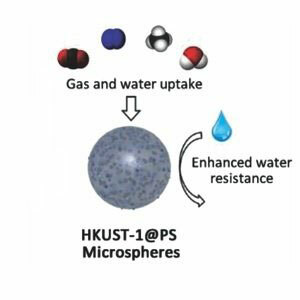 (Nanowerk News) Many Metal-Organic Frameworks are water labile, including the iconic Hong-Kong University of Science and Technology-1 (HKUST-1), which is very promising for many industrial applications. In an article published in Advanced Materials ("Protecting Metal–Organic Framework Crystals from Hydrolytic Degradation by Spray-Dry Encapsulating Them into Polystyrene Microspheres") and signed by RyC researcher Inhar Imaz and ICREA Research Prof Dr Daniel Maspoch, researchers from the ICN2 belonging to the Supramolecular NanoChemistry & Materials Group have reported that spray-drying encapsulation of nanocrystals of HKUST-1 into polystyrene microspheres is a straightforward, rapid and continuous method to protect the compound against liquid water and water vapours. Their method does not require any filtration or purification steps, since the composites are obtained directly in a dried, pure form. Although encapsulation always implies a compromise between the protection offered by polystyrene and the pore accessibility of the encapsulated porous material, spray-drying has enabled the authors to fine-tune the HKUST-1/PS ratio to achieve optimal trade-off in their [email protected] composites: they are resistant to liquid or vapour water yet retain most of the excellent gas sorption capacity of HKUST-1. In these composites, the polymer protects the embedded MOF crystals against water molecules, without substantially decreasing their initial sorption capacity, and increases their water resistance in terms of porosity properties. As in Metal-Organic Framework (MOF) mix matrix membranes, the permeability of the organic polymer in the composite should be one of the key factors to understand and enhance the gas and vapour transport towards the embedded MOF crystals. Here, for example, further experimentation aimed to study the water uptake kinetics is currently underway. Nevertheless, this method should enable molecular fabrication of various functional composites, based on the ever-expanding pool of MOFs and organic polymers, for a wide array of industrial applications such as CO2 capture from flue gas streams, heat pumps, or adsorption chillers.